The growing United States African immigrant community will have national representation on issues of economic development. Locally, African immigrants will have access to economic development services and advocacy that will strengthen their businesses, increase their economic success and sel f-sufficiency, and help them to become better integrated within mainstream economic and social systems. Mainstream organizations will have access to current and accurate information about the Emerging African Market, the community’s economic development needs, and opportunities for partnership that will benefit all. Opportunities to promote international business and trade with Africa will be facilitated. Immigrants have long contributed to the economy, intellectual capital, and social fabric of the nation. Immigrants make many important contributions to the economy by filling jobs, providing services, purchasing goods and services, and revitalizing neighborhoods and communities that are in decline. They provide new ideas and perspectives, make vital contributions in the fields of science, technology, and others, and they share their cultural traditions, art, and cuisine that enrich our quality of life. The African immigrant population is emerging as a sig nificant participant in the national economic sphere with numbers totaling over 1.3 million. Minnesota, along with other states including California, New York, Texas, Maryland, New Jersey, Georgia, Virginia, Massachusetts, and Florida, benefit from being home to the largest African immigrant populations in the U.S. Currently, little is known about this growing segment of Americans, including their consumer needs, buying power, and contributions to the workforce. Furthermore, as the population continues to grow, it is increasingly evident that its economic development needs must be addressed in order to maximize the success and health of businesses, communities, and families. Currently, few local organizations exist to address these needs, and the U.S. African Chamber of Commerce is the only national entity that exists to provide representation and advocacy for the integration of Africans within economic development systems. The United States African Chamber of Commerce is a 501(c)(6) organization that was established in 2008 by founder Martin Mohammed, President of the African Chamber of Commerce of Minnesota. Over the past several months, Mr. Mohammed’s vision for a national entity to represent the interests of African immigrants has become a reality. Mr. Mohammed began working with a top DC marketing firm, Cassidy & Associates, in 2008 to assist with the establishment of a national African chamber of commerce. In the fall of 2008, the USACC became a vir tual reality as it went live with a new professional website www.usafricanchamber.com. Over the past six months, the website has evolved into the organization’s epicenter, providing invaluable news, information on recent developments affecting the African immigrant community, contact information for local African chambers across the country, and opportunities for businesses and other organizations to partner with the USACC to promote growth of the African business community and create opportunities for international business and trade with Africa. Key to the success of the USACC has been its ability to bring together diverse organizations and businesses with an interest in issues affecting African immigrants and their participation in U.S. market systems. Through the development of a membership and corporate sponsorship structure, the USACC has become the umbrella organization for Af rican Chambers of Commerce and Professional Trade and Business Associations throughout the United States and abroad. The USACC works together with partner organizations to share information, resources, and ideas that will support African immigrants and the growth of the African business community. The USACC has also been able to generate considerable support and build community networks by establishing a corporate sponsorship program, which offers corporate partners the opportunity to work with the USACC to develop individualized initiatives/programs to assist the corporation’s business objectives. USACC Founder and President, Martin Mohammed, recognized early on the importance of developing and maintaining critical information about the African immigrant community and its impact on the U.S. markets and economy. He knew that such information was vital to giving the USACC a nationwide presence and establishing the organization as a national communi ty leader. In collaboration, with New American Dimensions and Dr. Bruce Corrie of Concordia University in St. Paul, MN, Mr. Mohammed commissioned a first ever national market research study on the Emerging African Market. This leading study will be completed this month and will be presented at the April 28th national multicultural marketing conference in Minneapolis, MN. After generating enthusiasm for the study among key leaders during a recent trip to Washington, D.C., Mr. Mohammed also has plans to brief those in Washington on the results of this landmark research study. On an historic journey, Mr. Mohammed traveled to Washington, D.C. in January of this year to witness the inauguration of the first African American Pr esident in the United States. 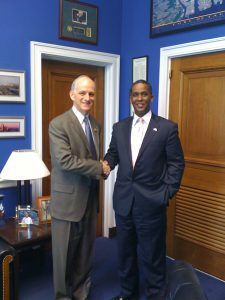 He took advantage of the occasion and in coordination with Cassidy & Associates was able to arrange crucial meetings with congressional members of the African subcommittee, public policy leaders, African Embassies, and other chambers of commerce, including the U.S. Chamber of Commerce and the U.S. Hispanic Chamber of Commerce, to brief them on the developments of the USACC and discuss opportunities for partnership and collaboration. Mr. Mohammed’s recent trip to Washington marked a decisive point in the development of the USACC. For the first time, the USACC attained a real and vital presence as a national advocate and representative for the African immigrant community, bringing together key figures from the U.S. and abroad , who will be essential for the success of the USACC and its goal to establish national representation for the African immigrant community. The USACC has garnered the support of many key organizations, including the Africa division of the U.S. Chamber of Commerce, the U.S. Hispanic Chamber of Commerce, and 22 national chambers and partnerships. The U.S. African Chamber of Commerce seeks to position itself as a premier national organization that effectively represents the interests of African business entrepreneurs and immigrants in the United States. Despite the progress and economic contributions that African immigrants have made in the United States, there remains the need to establish a national advocacy organization that represents the political, economic, and public policy interests of African immigrants. The U.S. African Chamber of Commerce is strategically positioned to fill this void at the national and state level, building on the success of the Minnesota African Chamber of Commerce and expanding its vision to provide national leadership on behalf of the African community in the United States. This new year witnessed the official launch of the USACC in Washington, D.C. with the visit of USACC President, Martin Mohammed, to Capitol Hill where he met with key leaders from Congress, African Embassies, and other Chambers of Commerce. Senators and representatives from strategic states, including Minnesota, Florida, New Jersey, New York, and Maryland, working on the African Subcommittee were eager to discuss issues of growing importance to the African immigrant community. Mr. Mohammed also established important ties with the U.S. Hispanic Chamber of Commerce and the U.S.-Pan Asian Chamber of Commerce that will be vital in working with the Obama Administration and the new Congress on key issues affecting immigrant communities in the U.S. Finally, with think tanks serving as the intellectual foundation for public policy discussions, Mr. Mohammed has established targeted relations from across the political spectrum, including the Brookings Institution, the Cato Institute, and Heritage Foundation, who are eager to assist the USACC efforts on Capitol Hill. With the development of the national chamber, the USACC envisions the development of African Chamber of Commerce branch offices in the top ten 10 st ates with large African immigrant communities. The national chamber has begun to develop partnerships with African Community leaders in each location, extending the Minnesota Chamber model, collaboration, and support for the development of local chambers that can be adapted to best meet the needs within each particular area. (Specified locations for the supporting branch offices of the African Chamber of Commerce have been determined based on census statistics indicating communities within the United States with the highest concentrations of African immigrant populations. The top ten communities can be found within the geographic limits of California, New York, Texas, Maryland, New Jersey, Georgia, Virginia, Massachusetts, Minnesota, and Florida.) The local chamber branches will play the key role of connecting African immigrants throughout the country with each other and with the services and support of the national chamber. They will als o provide local access to economic development services and advocacy that is language appropriate and culturally relevant.concentrations of African immigrant populations. The top ten communities can be found within the geographic limits of California, New York, Texas, Maryland, New Jersey, Georgia, Virginia, Massachusetts, Minnesota, and Florida.) The local chamber branches will play the key role of connecting African immigrants throughout the country with each other and with the services and support of the national chamber. They will als o provide local access to economic development services and advocacy that is language appropriate and culturally relevant. MISSION: To Accelerate the development of African businesses, entrepreneurs, and families so that they may thrive within American economic and social systems. Community and Business Advocacy includes systems change initiatives, educating leaders and decision makers about the needs of African communities, membership & networking, identification of the Emerging African Market, leadership tra ining, consumer protection, and alternative lending options for Islamic families. Microbusiness Development includes providing information, education, counseling, and access to resources that allow African immigrant businesses and entrepreneurs to achieve success. Education and services are provided in the areas of business plan development, business finances, access to resources, marketing, and general business development training. Individual & Family Financial Empowerment includes providing information, education, counseling, and access to resources that allow African immigrant families to increase their financial well-being. Education and services are provided in the areas of basic financial systems, housing/home ownership & asset creation, and consumer protection. One of the key goals of the U.S. African Chamber of Commerce and its vision for a national chamber is to play the role of the development and management of current and accurate information about the Emerging African Market, as well as other information on community needs. The USACC has already begun to develop research in coordination with some of the nation’s leading researchers. On March 13, 2008, the organization’s leadership participated in the 4th Annual Multicultural Midwest Marketing Conference where the Emerging African Market began to be identified and defined. The organization received certificates of commendation from both the State of Minnesota and the City of St. Paul for its leadership and outstanding support of the conference and its efforts to disseminate new information and develop strategies to build relationships with emerging African consumers in the Midwest. Dr. Bruce Corrie from Concordia University, a leading Minnesota Economist, developed research on the Emerging African Market and presented his research at the conference. Building on the success of the conference, the USACC commissioned a first of its kind research study of the Emerging African Market in collaboration with Dr. Corrie and New American Dimensions, a research firm out of California. The study is now in its final stages of development and will be presented at the 5th Annual Multicultural Marketing Conference, produced by Aguilar Productions, to take place on April 28, 2009 at the Hilton Hotel in Minneapolis. The presentation of the study at the conference will include results of the following specific topic areas: Identity and Life Activities, Shopping Habits, Financial Planning and Investments, Media & Advertising, Language and Acculturation Level, and Background and Demographics. A focus group video will also be presented along with a panel discussion with key African leaders and marketing experts, including Mohammed Agoubi, U.S. Bank, Richard Venegar, Milestone Growth Fund, Sarah Harwell, M & I Bank, Readus Fletcher, City of St. Paul, and Benin Brown, Pamoja Media. There are numerous ancestral Afro-religious organizations in the U.S. committed to the resurrection of African spiritual and ritual traditions. The top three occupations among African immigrants in the U.S. include Management & Professional Services, Services, and Sales. The top three industries in which African immigrants work include Education & Health Care, Retail Trade, and Professional Services. 41% of African immigrants in the U.S. are home owners, and 18% live below the poverty line African immigrants from many different countries have unique language and cultural traditions and are impacted by important historical legacies that must be considered in successful marketing efforts and service provision. African immigrants from many different countries have unique language and cultural traditions and are impacted by important historical legacies that must be considered in successful marketing efforts and service provision. The development and management of current and accurate research about the Emerging African Market will establish the national chamber as a leading authority and advocate for its community. It will also provide the tools to begin building partnerships with a variety of businesses and organizations across the country that will lead to increased participation by African immigrants in the economy and market. During Mr. Mohammed’s trip to Washington, D.C. in January 2009, he was able to generate considerable enthusiasm for this vital research study and make preliminary plans to present the results to key leaders in congress, strategic think tank communities, and other chambers of commerce, who have expressed their interest in the findings of the market research study, which is soon to be complete. The USACC recognizes significant opportunity to develop business and trade with Africa that can provide significant benefits on both continents. With a national chamber in place, the structure exists for developing ventures and gaining political support for the development of policy for advantageous trade. The USACC has progressed on this goal through planned participation in a trip to Africa in 2009 with Minnesota Governor Tim Pawlenty. In addition, Mr. Mohammed was able to meet with African embassies from South Africa, Ethiopia, and Ghana in Washington. After the meeting, it became evident that the USACC will play a vital role in establishing collaboration and cooperation with and be tween the embassies and the USACC in order to facilitate broader U.S.-Africa relations and effective advocacy on behalf of African immigrants in the U.S. Further meetings are also planned with the Ambassador of the African Union and the Dean of the African Ambassadorial delegation, the Ambassador from Djibouti, to discuss the USACC and its role in U.S.-Africa trade and international relations. With the release of a study conducted by the U.S. Chamber of Commerce on opportunities in Africa for U.S. businesses, the USACC will also work with the U.S. Chamber of Commerce in an effort to bring chambers of commerce in Africa to Washington at the end of the year.